Less of an Ultrabook, more of a desktop replacement. Good performance; Looks good; Large touchscreen; Ergonomic keyboard and touchpad; NVIDIA graphics; Good battery backup. All ports unconventionally placed at the back; Heavy; Bad display viewing angles; Muffled sound via speakers; Expensive. Ultrabooks have been around for more than a year now, and we have been able to get our hands on a few. 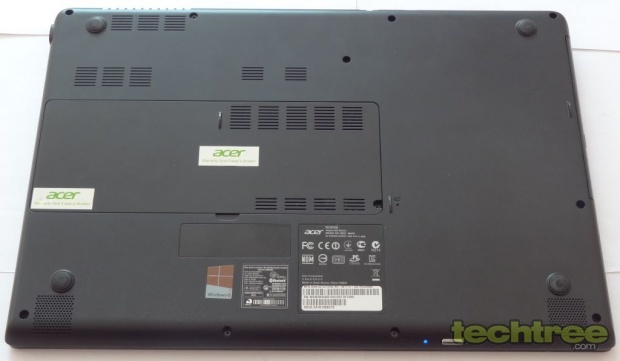 However, the Acer Aspire M, although branded as an Ultrabook, seems to be more of a desktop replacement with a large 15.6" multi-touch screen (the first Ultrabook from the company to have this feature) that can take full advantage of Windows 8. It also packs in better gaming power with a discrete NVIDIA graphics (rather than onboard) and Dolby Home Theatre v4 audio enhancement. The hybrid laptop also promises up to 8 hours of battery life. The Acer Aspire M3 Touch appears distinct from regular laptops with its casing having a suave black graphite-like finish that will delight people, but especially business users. The back of the lid (behind the screen) is metallic, while the rest of the body, although appearing similar, is made of a polymer that looks similar. The lid opens smoothly, but firmly up to around 150 degrees. The overall build quality appears to be great with no moving parts. In case you are picturing this to be a thin, portable, and light device, like I did, let me tell you that it is not really the case. It houses a 15.6" screen, remember? Its weight of 2.25 doesn't really make it easy to be carried around either. The LED-backlit display is 15.6" diagonal with pixel dimensions of 1366x768. It features 10-point capacitive touch input capability. It is instantly noticeable that this screen doesn't have a frame with the glass extending right up to the edges. The top, left, and right bezels are 0.5" thick, while the bottom bezel is the thickest at 0.9". Where one would normally expect a Windows button in some form on a Windows 8 touch device, there is an ACER logo at the centre of the bottom bezel. 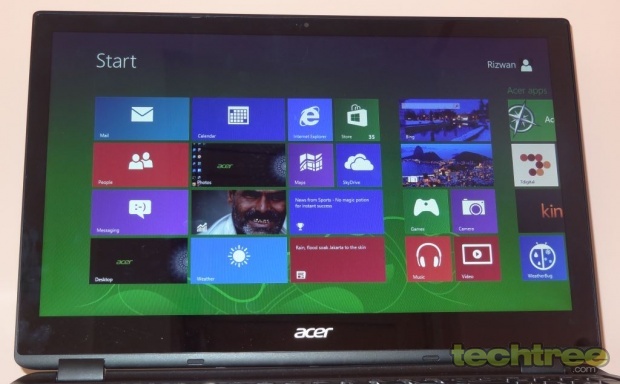 The size of the bezel makes it easy to use the edge controls of Windows 8 UI. A webcam is present at the centre of the top bezel with an ambient light sensor besides it. It is not yet clear if this is Gorilla glass, although we can assure you from personal experience that we were not able to get a scratch on the glass using metallic objects such as keys. The island type keyboard is spacious with a nice amount of space given to the palm rest. The keys are nicely spaced out and there is even a dedicated numeric keypad. While most of the keys appear to be of the right size, the cursor keys could have been a little larger. The keyboard is not backlit and there are no LED indicators to show the status of the various locks. The touchpad with a matte finish is generously sized, measuring 4.25" across and 3.1" in height, giving enough space to comfortably manoeuvre the cursor. It is located intelligently off-center, towards the left to avoid accidental touch inputs while typing. Mouse buttons below the touchpad are demarcated. Acer has placed all the ports (HDMI, two USB 2.0, one USB 3.0, Gigabit Ethernet, and a headphone/microphone combo) on the back, which reduces the ease of accessibility. as you will always have to reach to the back if you want to plugin anything even as simple as a headphone. 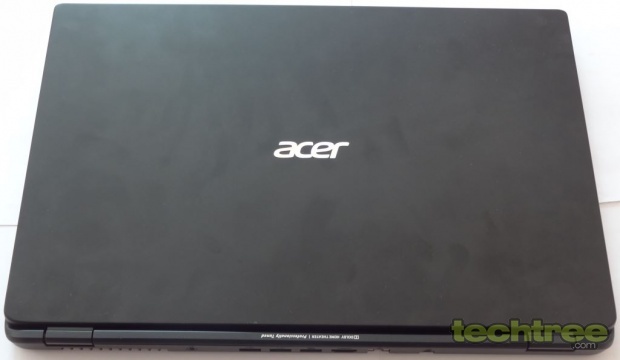 Acer has managed to put in a DVD writer on the right of the device along with a multi-card reader. The left is devoid of any ports and it is here where there should have been at least a few of the aforementioned ports. A shiny chrome power button is present at the front right with power (blue) and charging (orange) LED indicators adjacent to it. The underside has ventilation grills, allowing the laptop to run cool in conjunction with two fans. Stereo speaker grills are present near the front on either side. The battery cannot be replaced in this laptop, but you can replace or upgrade RAM and storage. The Aspire M3 runs Windows 8 Pro 64-bit and is powered by a dual-core Hyperthreaded Intel Core i3-3217U running at 1.8 GHz with 4 GB of RAM (upgradeable to 6 GB). A 500 GB 5400 RPM SATA hard drive takes care of internal storage. There is also a 20 GB SSD-cache that works with the HDD to form a hybrid drive that performs better than a single HDD. An NVIDIA GeForce GT 640M 1 GB discrete graphics card is present inside to aptly take care of moderate gaming, while there is also the Intel HD Graphics 4000 that takes care of less demanding tasks, while conserving battery power. Thanks to Optimus Technology switchable graphics, user intervention is not required to switch between these graphics chipsets, although the user can still manually opt to choose which graphics processor to use. Battery backup is by a 3-cell 4850 mAh Li-polymer one. In addition to the OS, there are a host of bundled software from Acer. A trial version of MS Office 2013 is also provided, although you will eventually have to pay for the full version or opt for a free office suite. McAfee Internet Security Suite and McAfee Anti-Theft are also provided to take care of security. The Acer Aspire M3 Touch boots in 17 seconds, which is not as fast as an SSD-only setup, but is still faster than what you can expect from a 5400 RPM HDD. The performance is good and the laptop continues to perform well even when multiple applications are opened simultaneously with the antivirus running in the background. The keyboard has good ergonomics due to the spaced out keys and it is not tiresome to type for long durations. The keystroke of 1.5 mm provides good tactile feedback. The touchpad is likewise easy to use due to its large size, making cursor control very easy. Display: The screen's touch response is quite good and there is no noticeable lag at any point. There is some trailing (when you move an object on the screen, you can actually see its 'trail'), which somewhat spoils the experience. The glossy finish of the screen makes it very reflective and difficult to use with light shining from behind the user. The display dimensions of 1366x768 seem to be low for a display of this size. Being a TN panel, the viewing angles suffer greatly, both vertically as well as horizontally, thus you can see deterioration in colour reproduction rather easily. This becomes more evident when watching dark visuals as black colour quickly changes to grey when viewed from a wider angle. In any case, the colour reproduction is nothing to write home about. Audio: The laptop features Dolby Home Theater v4 sound. In practice, it is quite loud, but it just doesn't have the clarity that I had expected. The audio sounded muffled, in effect, producing more bass and less treble. Of course, that doesn't mean that it is good at producing low frequency sounds either. The result was that dialogues in movies were inaudible at times. Plugging in headphones revealed that the problem is only with the speakers as audio sounded fine on the headphones. 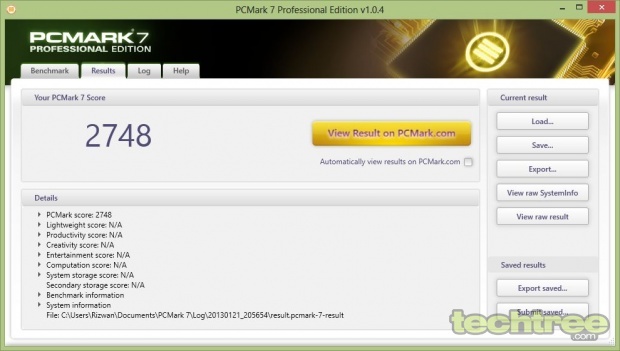 The NVIDIA GeForce GT 640M is a powerful graphics processor (for a laptop) and the results show while gaming. This laptop could easily play Battlefield 3 with details set to High and the gameplay appears very smooth, even at its default 1366x768 display resolution. 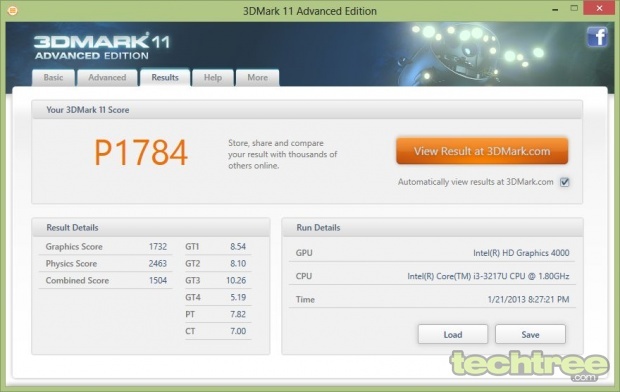 The 3DMark 11 results also put it ahead of most laptops we have tested thus far. The laptop does get hot when stressed, such as during gaming for more than half an hour. But should not pose much of an issue as long as you place it on a desk. We conducted a few synthetic benchmarks to find out how the Aspire M3 Touch performs. 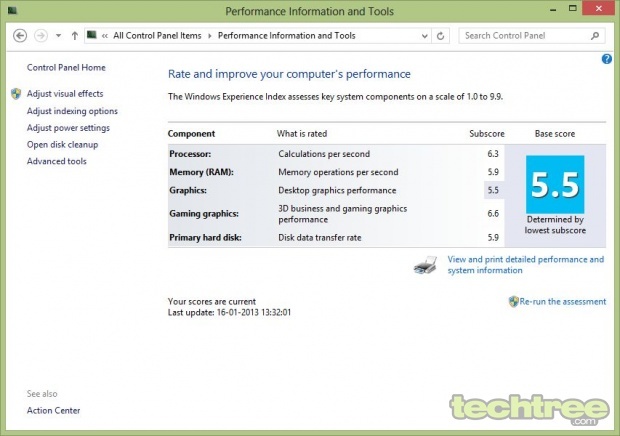 The benchmark results indicate a very healthy performance from the M3 Touch. It is easy to deduce that the device is perfectly capable of handling office tasks as well as multimedia, and casual gaming. However, excessive multitasking such as opening multiple programs and several tabs in browsers must be avoided as it slows down the system. A battery backup time of 2 hours 42 minutes was registered in the Classic test, while the Reader's test result yielded 4 hours 33 minutes. In normal usage that involves using office applications, surfing the internet, occasional music and video, and watching some YouTube clips, the battery lasted for over 7 hours, which is reasonably close to the claimed 8 hours. This is a good battery backup for a Windows 8 Ultrabook that contains power hungry components such as a discrete graphics card and a large touchscreen. The Acer Aspire M3 Touch is a capable performer in both office applications as well as gaming. Its display quality is nothing to write home about, but it is nevertheless as responsive as you would expect of a Windows 8 capacitive multi-touch screen. The large 15.6"screen size and the weight make it ideal as a desktop replacement, rather than as an Ultrabook that can be carried around. 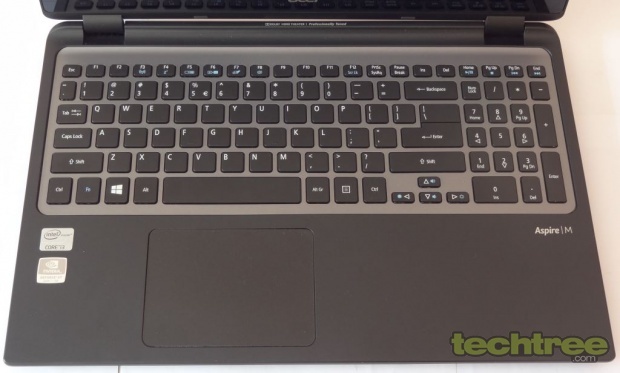 One of the interesting things to note about this laptop is its switchable graphics that can switch between discrete NVIDIA and onboard Intel graphics according to application load, and thus help get a better battery backup. The Aspire M3 doesn't just good look, but also sports excellent build quality. The battery backup time is also noteworthy for a laptop with discrete graphics. 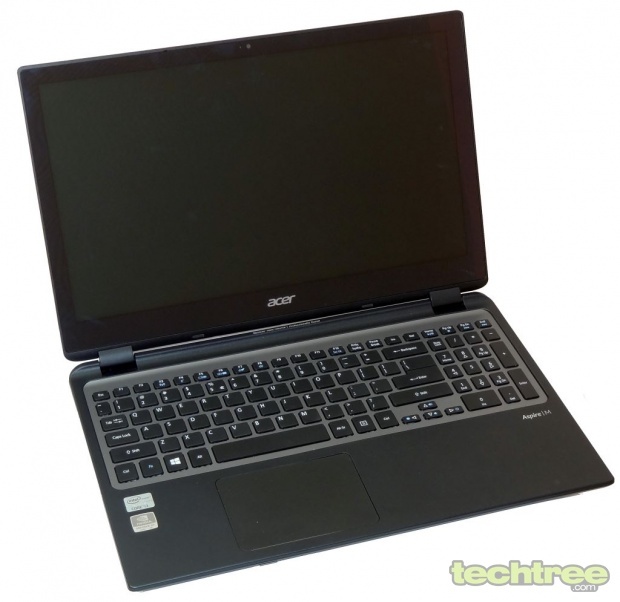 Priced at Rs 63,000, this seems to be a good buy, but if you are not going to use the touchscreen, you can opt for the Acer Aspire Timeline Ultra M3, instead for around Rs 50,000 with almost the same hardware, except that it has a Core i5 (which is faster) and more importantly, lacks the touchscreen.